The reality in business is if you can’t describe your business to a prospect in one sentence, something is wrong. Let me start by confessing that I am not known for my brevity both in speaking and writing. However, I have accepted that in today’s limited attention world you have to be even more concise and to the point when speaking to prospects, or really anyone, about your business. I am reminded of the importance of this while reading a recent book by Donald Miller called Building a Story Brand. Donald Miller has an entire process for helping businesses clarify their message in order to get prospects to take action or engage with your company or brand. Most business people have heard of the elevator pitch, but the reality is those elevators are now faster than ever, so it’s in your interest to condense what your business is or offers to one sentence. If you execute one great sentence that captures the attention of your prospect or potential customer, then you might have the opportunity to tell them more. So, at this point you may be saying to yourself, “Okay Cliff, tell me about the Customer Focused Marketing Group in one sentence.” Here we go; The Customer Focused Marketing Group is a fee-based company which functions as an in-house marketing department for small to medium size entrepreneurial businesses. Now, believe me, the Customer Focused Marketing Group does a lot of things that fall under that description. We do media buying, strategic marketing planning, supervise social media accounts, email marketing, and direct mail, all of which we do for a fee without marking up anyone else’s work. But it is easy to see how a business person might fall asleep before I got the chance to spit all of that out. I’d also like to clarify that this one sentence is NOT a mission statement. A mission statement is a statement about what you want your company to be about and how it achieves the realization of its goals. This one sentence marketing statement should clearly communicate why a prospect should be interested and would benefit from doing business with you. 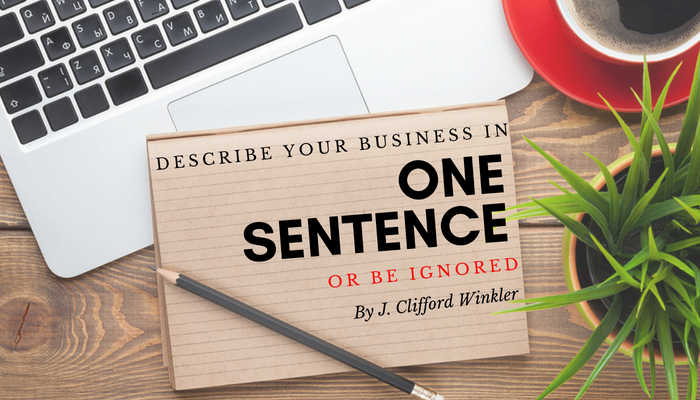 For me what works best is to start by writing the most concise two to three sentences that you can to describe your business. Then, ruthlessly edit to just the most critical part of your business. Again, keep in mind the one sentence should tell them clearly why they would benefit from doing business with you. This sentence should be structured to make it so that the prospect or the person you're speaking with understand, in one sentence, what your business does. This is very different than how your business does it, what goes into doing it, how successful you’ve been at doing it, and all the other things you would likely want to communicate. For almost every category of business, people have mental slots. If you don’t connect with one of those slots, you might create confusion, and people hate confusion. The goal of your one-sentence statement is to hopefully interest the person you’re talking to enough that they will say the magical words, “tell me more”. Sometimes what you leave out is what creates a curiosity, and curiosity can be a powerful engagement tool. I think it’s best to think of this process as creating a great headline that prompts you to read, listen or view the rest of the story. Headlines don’t tell you everything about the story, they interest you in hearing more about the story and that should be the goal of that one sentence. Good luck. * These examples came from Donald Miller’s Building a Story Brand.